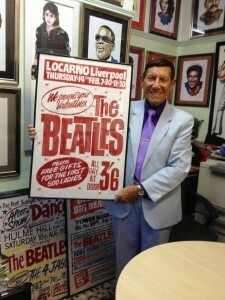 The man who designed most of the posters for The Beatles’ Merseyside gigs has been enlisted to create the artwork for the Cavern Club’s 60th birthday next year. Tony Booth, who is now 82, was discovered by Beatles manager Brian Epstein on Whitechapel when he was in his early 20s, and he went on to create some of the promotional material which helped to launch their early careers. Tony, who appeared on BBC’s Inside Out North West this week, did a lot of business with Mr Epstein, including producing posters, printed leaflets and a wide variety of publicity and display material for his record shop, NEMS. When Epstein moved into the music scene with The Beatles, he took Tony with him. The former Wallasey School of Art and Crafts student would hand-paint up to 10 of the same poster. He used one-stroke brushes and oil-based colours on mostly white machine-glazed poster paper. Most of his original hand-painted posters were thrown away after the event, but the printed versions that have survived have been sold to collectors for more than £6,000 each . 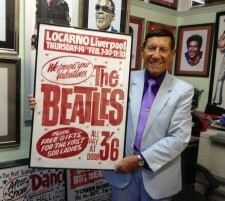 One of Tony’s original hand-painted Cavern Club posters was sold to an American collector a few years ago for £27,500. Tony is still making hand-drawn replicas of his own 60s classics in his front room in Moreton on the north coast of the Wirral, for fans and collectors all over the world. Mr Booth was also recently given the honour of creating numerous posters for the ITV production of ‘Cilla’, and now he is designing the artwork to commemorate the Cavern’s 60th.